Well its not a great day to go fishing, the wind is blowing so hard the Neon in the windows at the store is rattling like crazy. But it is a good day to do a little Christmas shopping at the tackle shop. 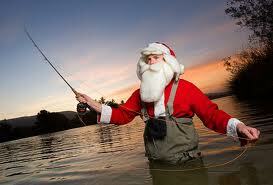 Whether you are looking for a new Rod/reel for that special some one, stocking stuffers or just a gift Certificate. We will be hear to day, tomorrow till 3pm and Monday till noon. If you need special assistance just let us know. This is a memorial down at the Burcaw commercial fishing dock. 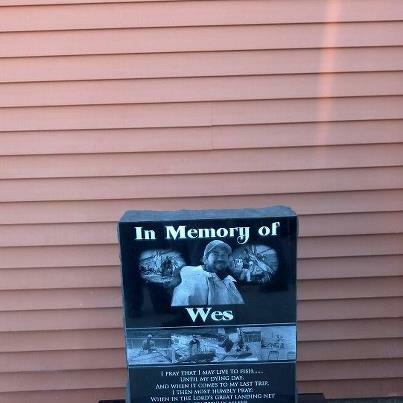 It is in memory of Wes a long time Sea Isle City fishermen and also lists some other fishermen from the aria. If you have spent any amount of time fishing in Sea Isle you will know and miss all of them. Check out this 13 Lb 10 Oz Tog Big Ron landed wile fishing aboard the Star Fish Party boat yester day. Captain Mike has been putting a lot of meet on the boat the past couple of trips and said he thinks they will keep biting well for a wile. For more information about the Star Fish call (609) 263 – 3800 or call me at the store.